Kenneth Thexeira has never been one to bother with New Year’s resolutions, but this year he is making an exception. Resolutions maintained past . . .
Psssh...” is the sound of our resolutions fizzling out by February. But why do so many people keep setting them? Tradition, wishful thinking, boredom? Perhaps just the hope of steering the course right for the new year, never mind where we end up. Kenneth Thexeira has never been one to bother with New Year’s resolutions, but this year he is making an exception. Along with millions of people who set yearly goals for themselves, Mr Thexeira has armed himself with a resolution in 2017, too. The wrestler, a pioneer member and performer at Singapore Pro Wrestling, has promised himself that 2017 will be the year he breaks into Japan’s competitive world of wrestling. What will it take? Ramping up his training, for one thing, and making every performance count until he catches the attention of a Japanese promoter that deems him good enough and deserving of a slot on the latter's show. "The thing about wrestling in Japan is that not anybody can just decide to get in. You have to be of a certain calibre to be on their shows. I've had a good 2016, wrestling in five new countries, bringing the number of countries I've wrestled in to nine," he says. "I also won the Malaysia Pro Wrestling Regional Championship and the inaugural Wrestling Championship of Singapore in 2016. For someone who's had a stellar year, I want to better it this year. I need to push myself to be gaijin-worthy." Gaijin is Japanese for 'foreigner'. Mr Thexeira's resolution reverses years of resistance to the age-old tradition that revolves arbitrarily around the first day of the year. Perhaps the difference is how much he wants it this time. "I come from a sport where we are required to push onwards and upwards with each passing show. It's a matter of continuous improvement, so it doesn't matter which day or month I'm in. The priority is getting better and getting more gigs," he says. The way he puts it, there is almost a weakness in having to write down your goals in order to achieve them. But not everyone possesses the steely determination of a wrestler. And, many never achieve their resolutions despite penning them down. The odds are simply not in their favour. Nearly nine in 10 people who set New Year's resolutions do not achieve them, a 2007 study by Richard Wiseman from the University of Bristol shows. In fact, mobile app Foursquare Swarm pooled its data and found that while visits to the gym indeed increase and visits to the fast food restaurants decrease in January, the two trends converge on the first Thursday of February, which is also the point when the new stash of willpower for the new year starts to peter out. They call it the "Fall off the wagon Thursday". If you believe this estimate, it would mean that you may be lighting your first cigarette of the year on Feb 2. "Ultimately, most New Year's resolutions involve going against one's nature: changing deeply ingrained habits that have cemented through the years," says Tomas Chamorro-Premuzic, psychology expert and CEO at Hogan Assessment Systems. Yet, an informal survey of 10 people by The Business Times found that most of them continue to keep up the practice of making these resolution. Of the 10 polled, seven still make these optimistic promises to themselves. The three non-resolvers cite several common reasons for not engaging in the practice: For example, they consider the new year to be a completely arbitrary start point and believe that people should just act on whatever they decide to improve about themselves regardless of the time and season. Others work better with flexibility and short-term goals. Professional baker Dean Brettschneider, CEO of Baker & Cook, is one of them. He says: "365 days is a long time to stay focused on one or two things, particularly in today's world. My year is full of goals driven by daily influences, inspirations and people, so I need to be able to be flexible and make changes along the way." Well, if resolutions so often come to naught, why do we continue to set them? Dr Chamorro-Premuzic lists several possible reasons: "Tradition, hope, wishful thinking, boredom." A New Year resolver, actress Rebecca Lim, says that the point of making these resolutions is not so much about arriving at them, as it is to set the year off in the right direction. "I've known people who are afraid to set resolutions because they're afraid they can't fulfil them. But you know, I don't achieve all the resolutions that I set out to achieve... Even if you set the same resolutions for consecutive years, it doesn't matter, as long as you don't give up and you're going in the right direction." She may be right. Research by clinical psychologist John Norcross in 2009 found that New Year resolvers have a higher chance of success (40-46 per cent) in achieving their goals compared to non-resolvers (zero to 4 per cent). Stephanie Loh, founder and artistic director of STEP Studio, which conducts dance classes, also believes in setting resolutions because it makes her examine her own life, she says. For her, the collective act of people setting resolutions for the new year together carries a whimsical, almost dreamy quality. It allows her to hope, for one thing. "On New Year's Eve, everyone in the world... somehow carries hope within. And when many people set resolutions and feel hope together at the same time, it heightens one's strength in believing and hoping as well," Ms Loh says. "With that extra courage, when you set those resolutions for yourself, that's when the magic happens. That's when I dream about something new and visualise it becoming real for me. Without those New Year's resolutions, it would be akin to giving up on hoping for something better for yourself." Others set resolutions because their livelihood has impressed upon them the importance of having a goal. SEA Games Gold medallist and Singapore 10,000-metre record holder Soh Rui Yong says he sees the new year as an opportunity to assess what he wants to achieve, and plans small steps to realising them. "From running at a primary school sports day to now competing internationally and winning medals for my country, marathon-running has taught me that you'll be surprised at how far having a goal can take you," he says. Yet others review what they were not able to accomplish in the previous year, and set a resolution for the current year to correct that. Mercy Ho, a full-time volunteer with Tamar Village, an organisation in Singapore that helps women in red light districts, has resolved to prioritise spending more intentional and unhurried time with her family and her husband every week. This comes after an especially busy 2016 when it seemed that time with her loved ones was "too short and too quick" as she scurried between meetings related to her ministry work. She would like to start saving money for a rainy day too, and has in mind a target amount she wants to set aside for each person who is dear to her. Ms Ho says she usually sets a maximum of three resolutions a year to keep the whole enterprise manageable and realistic. Across the board, New Year resolvers welcome the chance to "reset the clock" and "clear the decks" for a new year. As Hamide Ahmet, human resource head of financial communications advisor Tulchan Group, puts it: "It's a chance to reset the clock. With each passing year, you gain more insights into your needs and wants, as well as your capabilities. These insights will allow you to refine the goal-setting process." 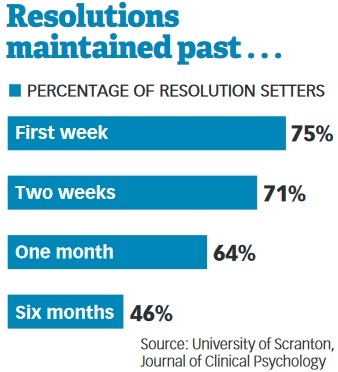 A 2014 study by Australian comparison website finder.com.au found that one in 10 resolution-setters failed to keep their resolutions simply because they made too many of them. As unbelievable as it may seem, 23 per cent of them also forgot what resolutions they'd set. The most common reason for failure by far was the setting of unrealistic goals (35 per cent), while another one-third did not keep track of their progress and drifted off-course along the way. Dr Chamorro-Premuzic agrees that people sometimes don't know what they are resolving to do. 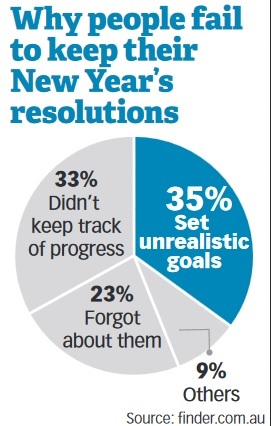 Most are not serious enough about their plans to make the effort to achieve their resolutions. They simply want change, but they don't want to change. "It is as if we all wanted to be fluent in Mandarin, but only if we don't have to work hard for it. If we can swallow a pill and be fluent, then we'll do it. But if it involves studying four hours a week, then no thanks," he says. On the other hand, research psychologist Roy Baumeister has also found an explanation that absolves us of blame. It's biological, he says. His research shows that humans have a finite amount of willpower - too little for the number of goals we set out to achieve. "We should respect the feebleness of self-control, and spread our resolutions out over the entire year," he said in a 2009 article in The Wall Street Journal. To him, a laundry list of resolutions threatens to overwhelm the individual. The likely outcome of pledging to lose weight, spend less, meet new people, and earn a promotion all at once is that you'll achieve none of them. "Because you only have one supply of willpower, the different New Year's resolutions all compete with one another. Each time you try to follow one, you reduce your capacity for all the others," he wrote in his book Willpower, with co-writer New York Times columnist John Tierney. Biology, it turns out, conspires against you. When people resolve to eat more healthily and actually follow through, they experience a sugar low. But, you need sugar to fuel the willpower to work on your resolutions. A lack of glucose affects our ability to exercise our willpower, much like how some people lose control over their emotions and tolerance of others when they are hungry. The Economist, in an article, summed up Mr Baumeister's theory nicely: "In order not to eat, a dieter needs willpower. Yet in order to have willpower, a dieter needs to eat." Wouldn't you know it? Our number one resolution of all time - to lose weight - has been the biggest impediment to all our resolutions this whole time. It is worth looking to the original resolution-setters for answers - the ancient Babylonians. At the start of each year - which began in mid-March - they made promises to their gods that they would return borrowed objects and pay their debts. Keeping their promise meant that their gods would bestow their grace on them for the next 12 months; breaking them would incur divine wrath. Today, perhaps the modern equivalent of raising the stakes would be the rise of the anti-charity. You pledge to donate money to a cause that you loathe if you fail to keep a resolution or achieve a goal. It is a "stick" rather than a "carrot" approach that is slowly gaining traction, and draws its roots from study findings that people are more loss-averse than reward-oriented towards goals. One website that provides such a service even lists fan clubs for Arsenal, Chelsea, Liverpool and Manchester United as anti-charities. Not quite a bolt of lightning from above, but close. Speaking of a higher power, it could also be worth sharing resolutions with our bosses, or people who have the power to help us reach our goals. Some companies such as Tulchan Group encourage their employees to set job-related goals every year. An employee might, say, express his hope of developing his self-confidence for leadership roles. He may suggest that this can be developed through opportunities to chair a certain number of meetings that year. Once the company signs off on his targets, it commits to helping him through these action steps. Throughout the year, they will also jointly refine the plan through regular reviews of his progress. This way, the individual's personal career development goals find their place in the larger corporate goal of talent development and retention. Kirk Westaway, chef de cuisine at French restaurant JAAN at Swissôtel The Stamford, also likes to hear about his teammates' goals. He recently sat down with his team to ask about their New Year's resolutions - about life in general, over and above their culinary aspirations. "I feel a very strong unity with my teammates in the kitchen.They are not just my colleagues, but friends whom I even consider as family. We spend 15 hours a day together in the kitchen and I really wish for them to grow as individuals and chefs through developing their skills and future knowledge," he says. After the resolutions have been set and the meetings have been had, the possibility of failure remains. If or when that happens, we need to be patient with ourselves, says Dr Chamorro-Premuzic. "Don't give up if you experience some hiccups. For instance, if you decide to quit smoking and you manage until March but then have a cigarette, your world shouldn't collapse," he says. "Keep going. What matters is where you end up, and that you have already improved." In a way, that is what a resolution is - a signal that you will keep going. It is a flare, sent out against all odds into the unknown entity that is 2017. That flare might go out: we will eat that burger, skip that workout and light that cigarette. But every 365 days, we will light that flare again and again and again, hope soaring with its projectile for something better yet to come. "My resolutions tend to be more personal stuff, like telling myself to work that 1 per cent harder at training. To be a more forgiving and less cynical person. To try to see more good in others that I haven't seen before. To give more time to my loved ones and appreciate my parents more." "In the New Year, I want to be more resilient in finding my own direction as a choreographer." "I am always seeking to acquire new knowledge and dining experiences combined with my passion for eating. Therefore, one of my resolutions this year will be to dine in more of The World's Best 50 Restaurants and to appreciate the current trends that are shaping the culinary world." "I hope to get organised and plan my time better for my family and work, perform better in my career, and connect more with my inner self. I also hope to do more good deeds and give back to society, as it gives me a sense of purpose." "I have many resolutions for the new year but one of the top ones is to bring my entire family for a nice holiday." "I hope to have constant unhurried weekly time for my family and my husband as a priority in my calendar, to read books that will help me to live out right values and develop my character, and to save money for rainy days." "I hope to wrestle in Japan. As a foreigner, it is extremely difficult to break into the Japanese market, as many of their talents are stringently homegrown. However, as I approach five years of training, and three-and-a-half years of live performances, I feel the time is opportune to tackle the hallowed, albeit very tough, Japanese industry."